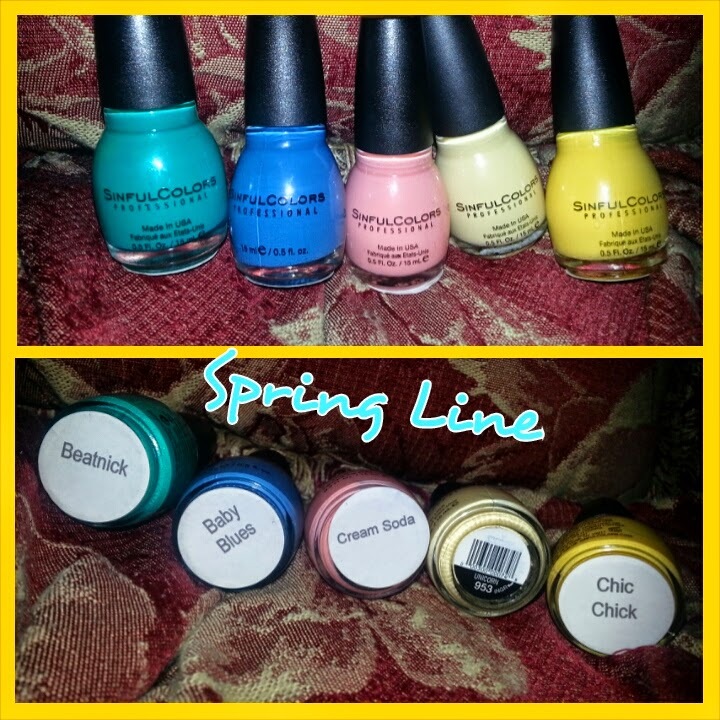 With spring time here I wanted to talk with you today about Sinful Colors new polish line. They have some amazing colors I absolutely love. I have always been a big polish fan and now that spring and summer are upon us and living in Florida our family always wears flip flops so of course we have to keep our toes looking cute and our nails too. There was five polish that I was able to review but more in the collection. The color I got were Beatnick, Baby Blues, Cream Soda, Unicorn, and Chic Chick all of these colors are super cute and beautiful in color. May favorite would have to be the cream soda and the and the baby blues but I do love them all that is just what I choose first. I don't have the best looking nails and now that I am writing this they look better then what they did in the photo. The green shade I am holding that is called Beatnick is a matte shade which is really nice I normally like to lock my colors in with a clear coat of nail polish but in this photo I didn't. Still loving all these colors. But what also makes SinfulColors such a runaway favorite is that our nail polishes are incredibly affordable. From the get-go, SinfulColors. Founders didn’t believe you had to charge an arm and a leg to produce and deliver show-stopping color. At a price as low as $1.99, SinfulColors makes putting the glitz on your nails a steal, not a splurge. Nails with bling are an easy and quick way to create your own look: the fabulous value SinfulColors offers (plus our huge variety of shades!) allows you to easily change your color to match your mood or look any time, any day. And with an unheard-of up to 20 new collections every year, all featuring the moment’s and season’s hottest colors, SinfulColors gives you even more reasons to make a statement about who you are.